(Chris Detrick | The Salt Lake Tribune) Brigham Young Cougars head coach Kalani Sitake and his players celebrate after targeting was not called on Brigham Young Cougars running back Brayden El-Bakri (35) during the game at LaVell Edwards Stadium Saturday, October 28, 2017. Provo • Kalani Sitake has seen it time and again in a football coaching career that has taken him from Eastern Arizona to Southern Utah, Utah, Oregon State and now BYU. Mormon missionaries return from two years of service and just aren’t able to fully participate the first half of the season, then don’t want to the second half because playing even a down of football would burn their redshirt year. Thanks to the new redshirt rule passed by the NCAA Division I Council last month, that’s no longer a concern. Players can now participate in any four games in a season without losing a season of eligibility. In essence, football players can now play 4 1/3 seasons. Because BYU — which is owned and operated by The Church of Jesus Christ of Latter-day Saints — annually has more returned missionaries than any other school in the Football Bowl Subdivision (FBS), Sitake sees the rule change as a “huge benefit” to his program. Last year, BYU had 73 returned missionaries on its roster, roughly 65 percent of the team. 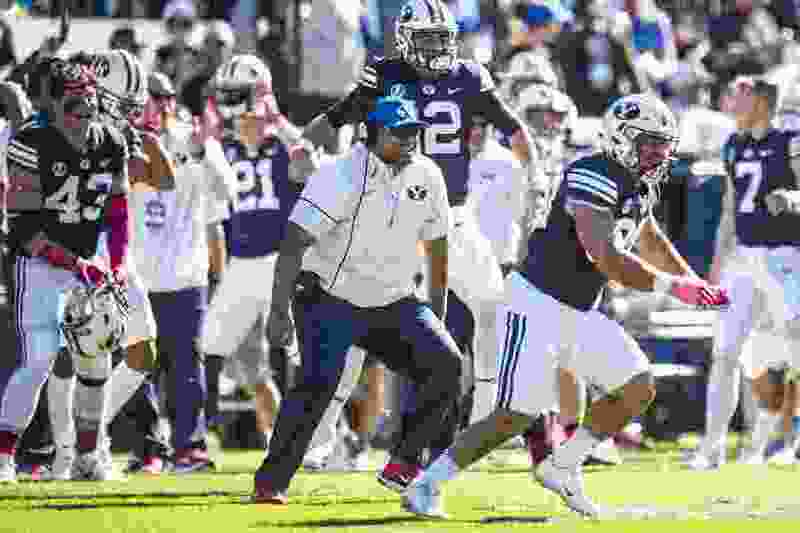 “We always have a lot of missionaries returning, and I can think of a lot of guys who got home in August or the end of July, and took some time to get in better shape,” Sitake said a few days after the rule change. “We probably would have been able to use them the last four games last year. New BYU quarterbacks coach Aaron Roderick fielded a lot of difficult questions during media day on June 22, most regarding who will be the Cougars’ starting quarterback when they open the season on Sept. 1 at Arizona. He did his best to keep a poker face and not give any indication which QB among senior Tanner Mangum, junior Beau Hoge, sophomore Joe Critchlow or freshman Zach Wilson had the upper hand. But when the former BYU, Snow College, SUU and Utah assistant was asked about the new redshirt rule, he smiled broadly. Sitake, Roderick and defensive coordinator Ilaisa Tuiaki said it is a rule change they have been begging for since they began their coaching careers. Roderick agreed that the new rule will influence how he uses his quarterbacks in 2018 because all four theoretically still have their redshirts years available, even Mangum.